Overshadowed by Rick's departure, it was also Lauren Cohan's last TWD episode - Oh No They Didn't! Last night, fans, stans, and trapped hate-watchers tuned in for Rick's last episode on The Walking Dead. What got overshadowed was Maggie's last episode. It was known for awhile this was her last season and showrunner Angela Kang shared she might be back, if she wants to. "That's the last of her for this season," Kang told THR. "I would hope it's not the last you'll see of her for the show, but she is not in any immediately forthcoming episodes." 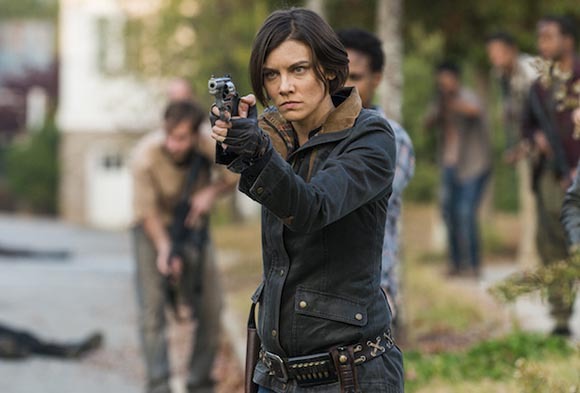 What's next for Maggie Greene? Lauren's slated to appear in ABC's Whiskey Cavalier next year. Angela Kang also said Maggie could have her own movie. "We’re just going to figure out different ways to do it. It might be me shooting Lauren in between scenes of Whiskey Cavalier, of Maggie in a post-apocalyptic Prague." a woman who fought for equal pay being forgotten? I've liked Lauren since Supernatural. She's not the best actress but I've always been into what she gives and I hope she goes on to good things. idgaf about TWD but her new show with scott foley looks fun. i'm looking forward to it. Just watched the trailer, I'm into it! But honestly it looks expensive... Which makes me nervous. ia, but i hope that's just the pilot lol, which must have had a bigger budget. idk idk it might flop but i think it'll enjoy it while it lasts because it's right up my alley and i like the cast. So what happened to her and baby Hershel? there's a 6 year time jump going forward from last nights episode. so i'm guessing someone will mention where her and the baby ended up. Also why do I care? michonne. and the time jump makes judith like...10 or 11 years old. Michonne. She calls Judith her daughter. We see an 8ish year old Judith at the end wearing Carls hat, weilding Ricks gun and a sword like Michonne. How did they write her and Rick out?? What's going on with Michonne and Judith? rick fell off a horse and got impaled by a rebar ,but got himself free. he blew up a bridge full of walkers and everyone thought he was dead, but got taken in a chopper somewhere with the main garbage lady and someone else. lauren didnt have any cliffhanger, just a confrontation/closure with negan and realized he might as well be dead anyway. michonne and judith are still out fighting in a time jump of several years, judith wears Carl's hat. rick blew up a bridge full of walkers while he was bleeding out from a wound and so everyone thinks he's dead, but in reality, jadis had this deal going with the mysterious people with the helicopter and she finds his body washed upon the shore and takes him with her off to wherever they're going. I stopped watching this like 4 seasons ago. How did they write Rick out? Spoil me. So, he's not dead. Oh well. I like her a lot, and actually liked her character from what I remember, but she's not a good actress. In all, I clung to S1-2 vibes for too long. I'm so disappointed how these character's arcs ended up. Don't watch the show, but I have been reading the posts leading up to last night's ep since I wanted to know what happened to Rick. Damn, I had no idea it was her last ep. This show really screwed her over. Also did any of the cast say anything??? Wow, how disappointing, but completely unsurprising. I am shocked the cast hasn’t said anything though. Of course Maggie was overlooked, they overlook everyone not Negan or Rick. It was unfortunate this was her last season because her character was finally becoming interesting.